I decided to take a walk last Sunday around my neighbourhood and I am amazed at the little details I miss on a regular basis. It is hard to keep abreast of what is around me when I drive by too quickly. As I walked up back north to Yonge and Finch, one restaurant caught my eye. I didn’t know there was a Lim Ga Ne in my neighbourhood. It was a restaurant that I have luckily picked one really cold night was at Bloor. If Sunday did not feel like spring, I would have walked in again for a Galbi Tang, a beef short rib soup that really hits the spot. I tried it last month during one of those nights where it was -20something with the windchill. Now you probably going to ask why would I be out and about at such a cold night. I just had to see the opening of an exhibition where my photographer friend Dave Addington had a few pieces on display. He always supported me on my openings so returning the favour was in order. Not that you really have to force me to go as his photography is compelling enough for me. But I digress. Let’s get the conversation back to the food. Dave’s exhibit was held at Ossington and Bloor and I thought I’d grab a quick dinner before I go. The most sensible thing to do was to find something to warm me up that cold night. Seeing Lim Ga Ne have enough people inside, how can I go wrong with the food? When I walked in, I saw that one table was just being vacated. For a moment, I thought they would make me wait for a smaller table as I was on my own and the table seats four. But when they asked me to take the table, that was such a treat. A few minutes later, several more hungry people came in. I was thankful for that little blessing of being ahead. Just like most Korean restaurants, the menu was extensive. But I kept with what I know. It helped that they had pictures of the food on the menu. I chose the Galbi Tang, beef short ribs with vegetables and clear soup. As I waited, I totally forgot that most Korean places provided an array of appetizers or ban chan while I waited for my soup. I happily snacked on Kim chi, fish cake, some sweetened beans, bean sprouts, onion pancakes and rice cakes. One can really get filled up just snacking on the appetizers that they give out for free. The soup finally arrived and I got another surprise that it came with a bowl of purple steamed rice. Me being me, I had to eat that one too. No Filipino would put aside rice, especially when it is newly steamed and warm. The bowl of soup placed before me was good enough for two people to share. Honestly, I was overwhelmed just looking at it. 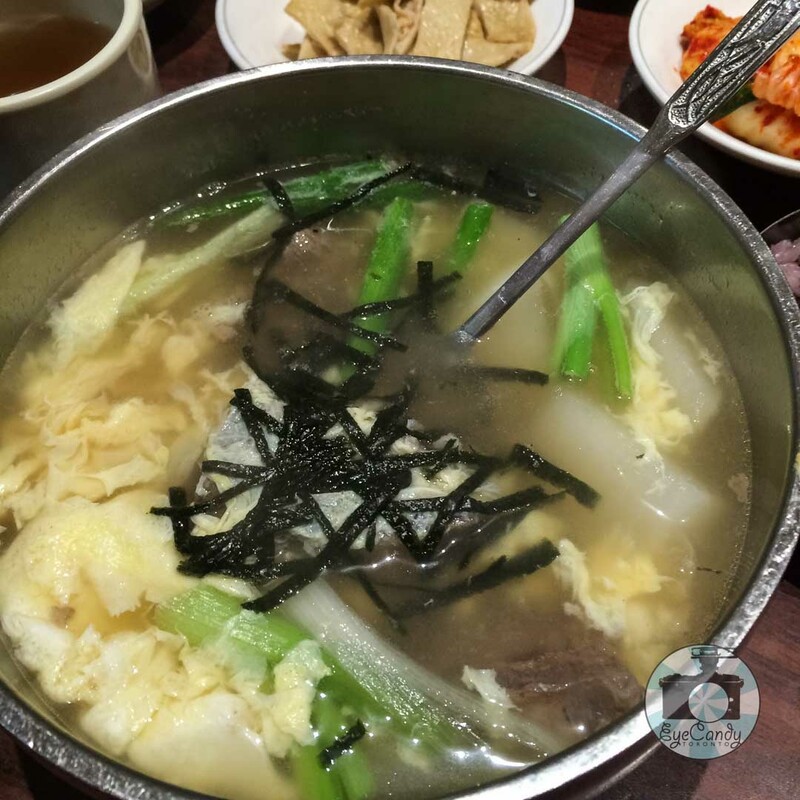 In my soup there were a mix of egg, daikon-like cubes, clear glass noodles, green onions and dried seaweed as garnish, all swimming in clear beef broth. It was so satisfying, I wanted to finish the whole bowl. I was in a daze at each spoonful. It tasted very similar to the beef soup I regularly had as a kid but it was far from having the same ingredients. I really tried to eat it as fast as I could, mindful of the other people waiting for a table. I tried to ward off the guilt that I was sitting on a four-person table as no matter I had good intentions to finish quickly, it was impossible with the amount of food before me. I finished with about a third left on my bowl, but that was as far as I could go. Suffice it to say, I was comfortably full when I walked in my friend’s exhibit. It was a good thing that the show had an eclectic mix of artists featured together with my friend Dave as I had a lot of food to walk off. And now I discover I can actually relive it without having to go too far. Life’s small blessings are indeed best when it comes as a surprise.